This Glazed Peach Streusel Bread is packed with juicy peaches and topped with a cinnamon crumble and sweet vanilla glaze. You’ll fall in love with the soft and fluffy texture and deliciously sweet flavor! When I was little, I lived just a few blocks away from my grandparents’. I loved spending time with them and would often ride my bike to their house or just stop over for a visit whenever I felt like it. Their door was always unlocked and my grandparents always stopped whatever they were doing to spend time with me. I wouldn’t trade those memories for anything in the world. Some of my favorite times would be the many barbecues and get-togethers that would take place at my grandparents’ house, just because. There wouldn’t have to be a special occasion or event in order to get together. My Grandma would call my dad and his siblings and invite everyone over for a Saturday night dinner. And that involved lots of laughs, sitting around the patio, and some delicious food. Those were the days! Now that the weather is getting warmer, I’m officially in the mood for fresh fruits, veggies, and lots of meal-time grilling. I know it’s not officially summer yet, but with Memorial Day just around the corner, I can’t help but dream of sitting outside on warm, summer nights, with lots of barbecues and get-togethers. Are you the same way, too? While I’m not the grill-master in my house (that would be the hubster), I do like to create some easy and fresh side dishes and desserts to go along with a grilled burger or chicken. And since I’m in a dessert mood, I decided to grab my favorite summer produce: peaches! But instead of a classic cobbler, pie, or crumble, I decided to whip up this Glazed Peach Streusel Bread. It’s a simple dessert that’s easy to transport to those barbecues and outings that are sure to take place in the summer. Once you smell the decadent aroma and cut into this bread, you’ll be amazed at the moist texture and delicious flavor. 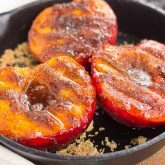 The peaches provide the perfect amount of sweetness, while the crumble and glaze gives it the finishing touch. 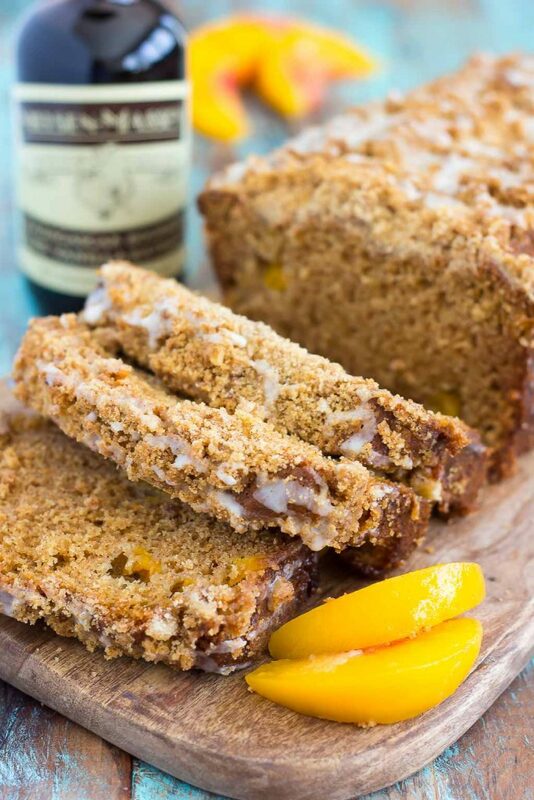 If you love anything with peaches, then this Glazed Peach Streusel Bread was made for you! In addition to grabbing some fresh peaches for this bread, I also reached for my favorite vanilla extract from Nielsen-Massey. Have you tried their products yet? 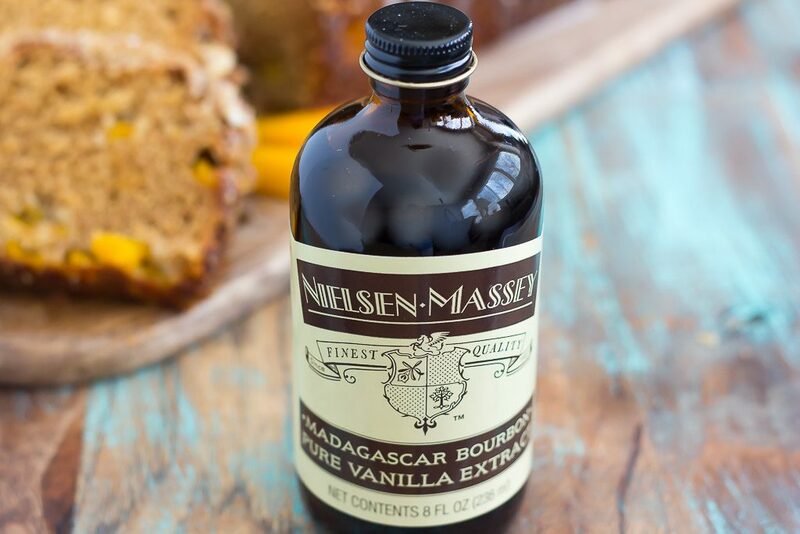 Nielsen-Massey has been making vanilla products for over a century, so it’s easy to see that their extracts and other flavors are made from quality ingredients. Besides premium vanilla extracts, Nielsen-Massey also offers a variety of other extract flavors, pastes, powders, sugars, and whole beans. So whether you’re whipping up a sweet treat or savory dish, they’ve got a product for you. So, it was only natural that I used Nielsen-Massey’s Pure Vanilla Extract when making this Glazed Peach Streusel Bread. And like most of my recipes, this sweet treat is a breeze to whip up! I modified this base of this bread from these banana muffins, which is a favorite of mine. You’ll start by combining the dry ingredients, followed by the wet, and then mixing both together. When the bread has completely cooled, you’ll add the vanilla glaze and then get ready to dig in! So, if you’re looking for the perfect dessert to jazz up those summer barbecues, this Glazed Peach Streusel Bread will be the hit of the season! 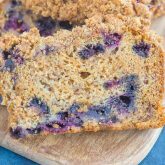 Looking for more quick breads? I’ve got you covered! This Glazed Peach Streusel Bread is packed with juicy peaches and topped with a cinnamon crumble and sweet vanilla glaze. You'll fall in love with the soft and fluffy texture and deliciously sweet flavor! Preheat oven to 350F. Lightly coat a 9x5 loaf pan with non-stick cooking spray. Set aside. In a large bowl, cream together the butter, brown sugar, and white sugar until light and fluffy. Slowly beat in the eggs, Nielsen-Massey Madagascar Bourbon Pure Vanilla Extract, and yogurt. Add in the flour mixture to the wet ingredients and mix just until combined, being careful not to over mix. Gently fold in the diced peaches. Spoon batter into prepared pan, filling half-way. To make the streusel, combine the brown sugar, white sugar, cinnamon, melted butter, and flour until thoroughly mixed together. Sprinkle over batter. Bake for 55-60 minutes, or until toothpick inserted into middle of bread comes out clean. To prepare the glaze, add powdered sugar, heavy cream, and Nielsen-Massey Madagascar Bourbon Pure Vanilla Extract in a small bowl. Be sure to follow Nielsen-Massey on Instagram for more recipe inspiration! This bread looks AMAZING, Gayle. I'm a streusel girl to begin with, and you added glaze and all the wonderful things. I think we're on the same wavelength today too, because we both made fruit breads! Yay for summer fruit! We're twinning today with our summer fruit breads! :) I agree, streusel and glaze is pretty much the best combo! Thanks, Mir! Thank you, Megan! I just can't get enough of peaches, especially in the summer! Some of my most beloved recipes are from my grandma's kitchen in Vermont, so I can totally relate! And now I am so excited for peach season!! Thanks, Kate! Aren't Grandma's the best cooks?! We clearly are in the same mood, Gayle, because I have been grilling and adding fruit to add the things recently! Nothing better, if you ask me... who cares if it really isn't summer yet? Not me!! Looooove this bread, girlfriend! Peaches, streusel and that glaze- gahhhh! Yahhhhhhsss! This is heavenly, and I need a few slices pronto! Pinned! Cheers, friend! P.s. it must have been amazing to live so close to your grandparents! Thanks for sharing your precious memories, friend! Thank you for the sweet comment, Cheyanne! Haha yes, I don't care that it's not summer yet...bring on ALL of the fruit and grilling! Oh, my! This bread sounds AH-mazing! I love the streusel topping and that GLAZE! Such a treat, Gayle! Gayle, this Glazed Peach Streusel Bread is everything! Those bits of peaches in the bread. . oh my! Looks soooooooo good! Can't wait for summer! Thank you, Demeter! I am getting excited for summer and all of the fun things that go along with it. Hope you have a wonderful Monday, too! This looks fantastic! 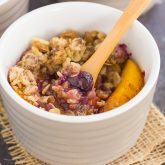 Peaches are one of my favorite fruits and I'm always excited to try new recipes using them :) I think the instructions are missing a step though - it doesn't say when to incorporate the dry ingredients (I assume after the yogurt is mixed in?). Thanks! Hi Natalie! Thank you SO much for letting me know about the recipe instructions...I definitely missed adding that step in and just updated it! :) Peaches are a favorite of mine, too. I hope you love this bread if you try it. And thank you for stopping by! Grandparents are so special! It's great that you lived so close to yours and were able to spend time at their house whenever you felt like it. This bread is certainly a great summer treat. Love those chunks of peaches!! Thank you, Jen! I have some of the best memories with my Grandparents! I'm so ready for warmer nights with fires, s'mores, and a big mug of coffee while watching the fireflies. And you are so right about this bread. This would be great at a barbecue. That's such a great idea for peaches. And I'm all about that topping! Sounds like you had a very special relationship with your grandparents, too! Thank you for the peach bread love, Annie! You and I are on the same wave length! I have been craving peaches for the last week, it is my absolute favorite thing in the Summer! I can't wait to try this! Thanks, Annie! Peaches are SO good in the summer! Those sound like great memories Gayle -- grandparents are the best! This bread looks like the perfect way to end a summertime BBQ too -- peaches are one of my favorite summer fruits and that vanilla sounds amazing! I don't think your photos could be any more beautiful! And this bread ... love peaches! Thank you for the kind words, Lauren! I loveeee peaches in baked goodies! And with a streusel?? Sold!! I'm the same way - the husband mans the grill and I make everything else!! haha I'm too dangerous around that thing! Those are such sweet memories you have with your grandparents. Mine live far away so I don't see them but twice a year. Regardless, this bread looks amazing. I love how you made streusel into something new! Bring on summer! I am most definitely saving this gorgeous quick bread recipe for when the peaches are at their peak around here! I seriously LOVE how super-moist this looks and all that glaze + streusel business is just amazing! I want a piece NOW. You know, when I read this I thought, "what is she talking about? Memorial Day is long over and we're into July already!" Lol. Oh wait. That's just in my editorial calendar! I so often forget what month we're living in. 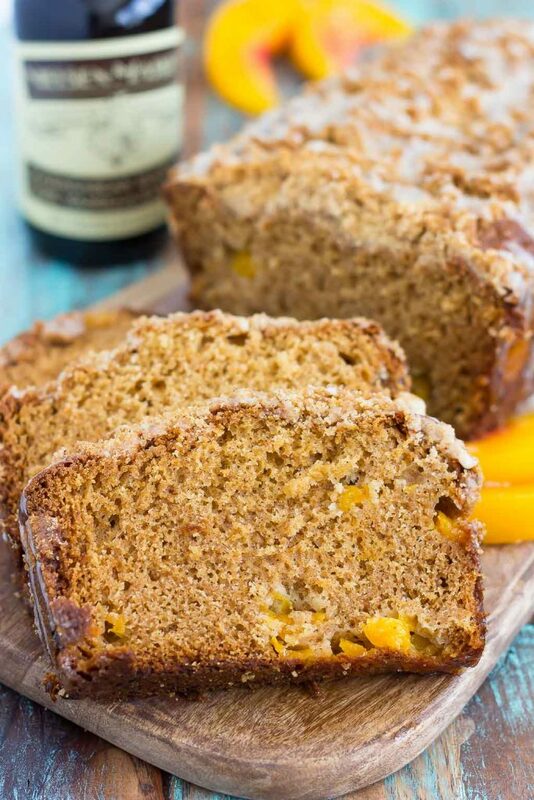 Either way though, this peach bread looks incredible Gayle! Delicious bread! Yum! Love, love your new website design. Very beautiful and clean! Thank you for the kind words, Valya! I can so relate to cherishing memories of grandparents. And this recipe sounds incredible. I love peaches, I love bread, I love streusel. . .this must be totally delicious. Thanks for the kind words and for stopping by, Kelsie! Aww I loved hearing about your grandparents! 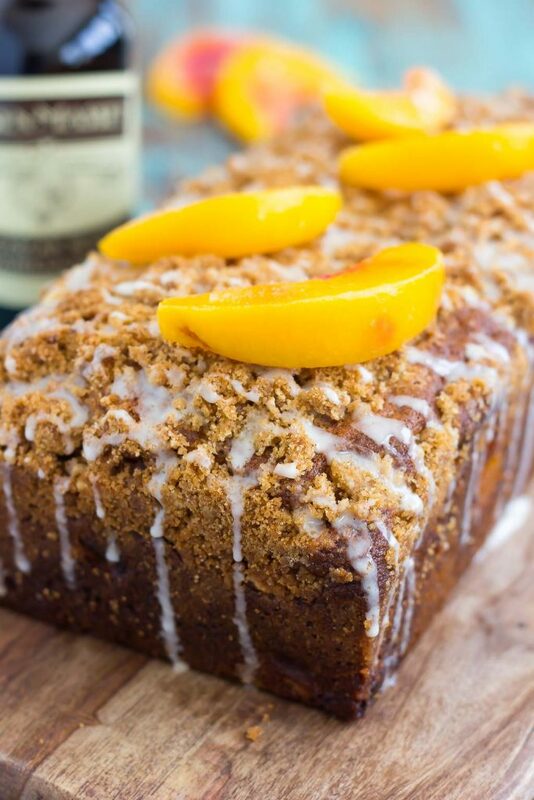 I adore this peach bread - it looks so delicious, and the streusel takes it over the top. Swoon! Gayle I love when peaches are juicy and super sweet! 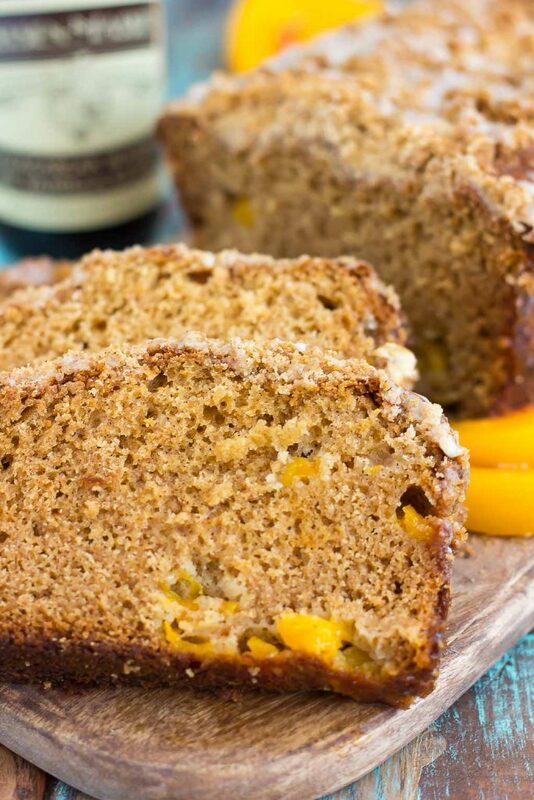 Never made a bread before with peaches but I think I might try this one as we are leaving for a road trip in few days and this would be great for snacking :) Thanks for a yummy recipe girl!! that's a gorgeous bread Gayle, so perfect for summers! 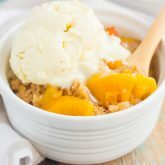 This looks amazing Gayle :D Never thought of using frozen peaches in baked goods :) Yum! I made this for our Labor Day dinner yesterday and it was fabulous. Used the last-of-the-season peaches. Thank you. I'm so glad that you enjoyed this, Laurel! It's a favorite of mine, too. Thanks so much for stopping by and letting me know how it turned out!